As part of an educational restocking program, Each spring, biologists, watermen , and environmental educators catch American shad in the Potomac, extract their eggs, and fertilize them. American shad are known for their shiny, reflective scales. Here, the fish have been collected for the restocking program. When the restocking program began in the mid 1990s, finding even a few American shad in the Potomac was a win. In the process of finding American shad, other fish species are inevitably caught in the gill net. Brad Harley (center) is the son of the waterman, Mike Harley, who originally helped mount the stocking program to restore American shad in the 1990s, after his father’s death, he now helps the biologists catch the fish they need for the program. Here, Jim Cummins (center), distributes the fertilized eggs into plastic bags for distribution to local schools. The school children watch the eggs for a week until they hatch, then they release the shad fry into the river, imprinting them to return 3-5 years later as adults when they are ready to spawn. Students at Westbrook Elementary release American shad fry into the Potomac near Great Falls in 2015. This was the school’s 20th anniversary of participating in the shad program. 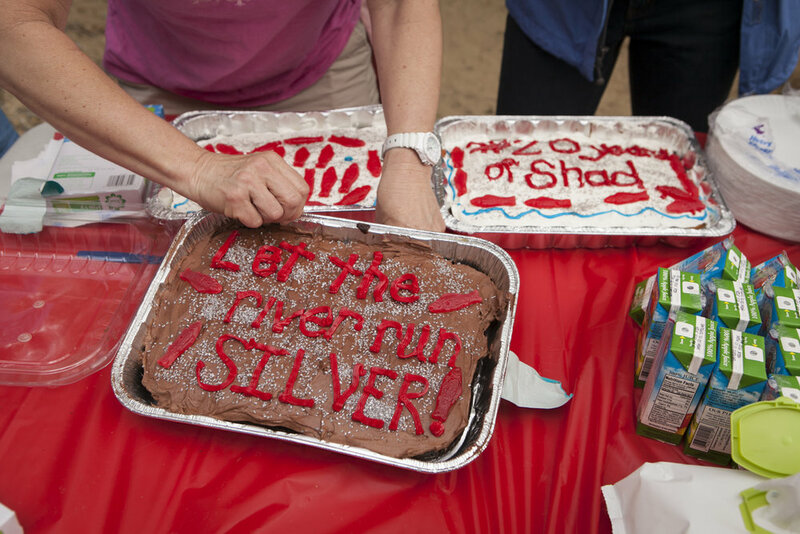 To celebrate 20 years of participating in the American shad release, Westbrook parents and teachers pulled out all the stops with signs and refreshments. Students from Westbrook Elementary release American shad fry into the Potomac on a muddy day. 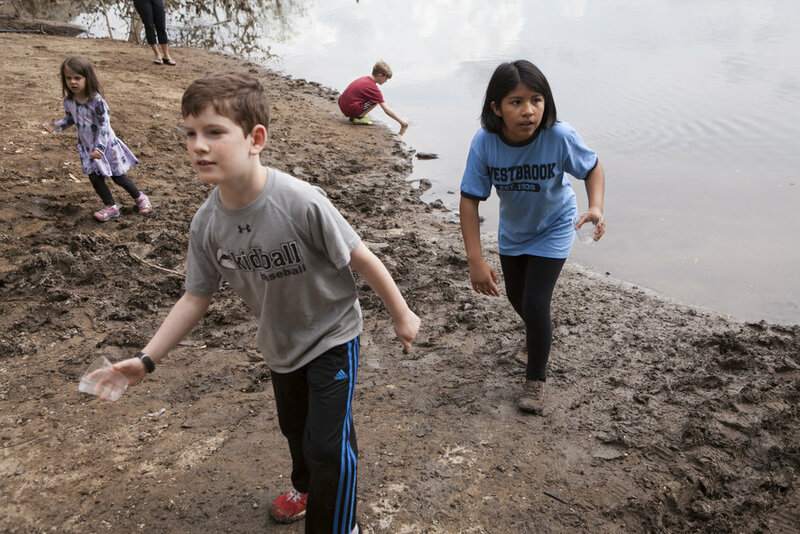 Students from Westbrook Elementary release American shad fry into the Potomac and then return up the muddy bank to re-fill their cups. Students from Westbrook Elementary participate in releasing American shad fry into the Potomac. The students who monitored the growth of the shad fry are members of the school’s environmental club, the Aqua Eagles. Students take part in Westbrook Elementary School’s 20th annual American shad release day. Students from Capitol City Public Charter school take part in a shad release day at the Anacostia River in Washington, D.C.
Students from Capitol City Public Charter school wait in line to fill a small cup with American shad fry, which they will then release into the river. 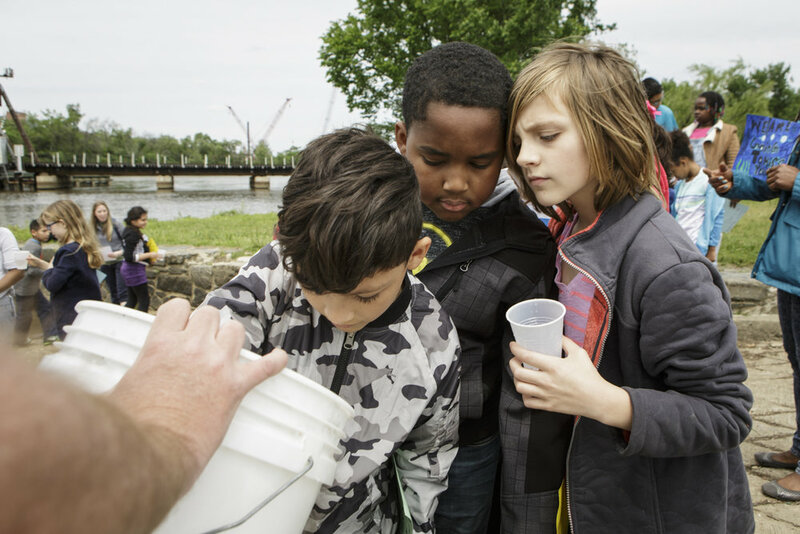 Students from Capitol City Public Charter school release American shad fry into the Anacostia. Though the Potomac river has been fully restored, the Anacostia is one of the rivers on the east coast where restoration work is still badly needed. A student returns after releasing American shad fry into the Anacostia River. In 2017, D.C. mayor Muriel Bowser declared American shad the official fish of Washington, D.C. Though the Potomac is fully restored, American shad in the Anacostia are not. Students from Capitol City Public Charter school created signs to bid their shad fry farewell. 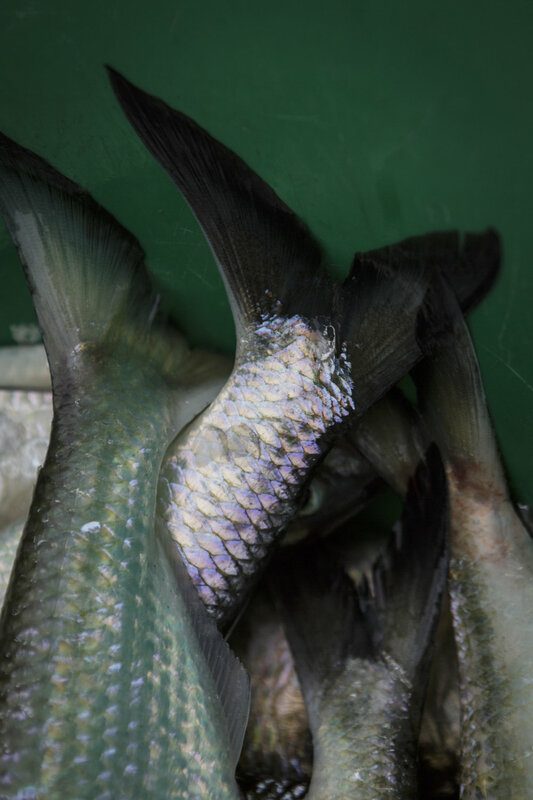 American shad were once so abundant in the Potomac River, that in their heyday, people said the river would "run silver" each spring when they returned to spawn. The anadromous fish is native to the coastal rivers of the eastern United States, including the Potomac, and they were a favorite catch for George Washington in his Mount Vernon fisheries. By the 1970s, this was no longer the case. Shad numbers were so low that even the most seasoned anglers went home from a day on the river empty-handed. Overfishing, pollution, and a loss of habitat brought on by the construction of dams, threatened American shad not only in the Potomac but all over the east coast. Were it not for the vision and hard work of a small, dedicated group of biologists, fishermen, and school children, American shad might have disappeared from our nation’s capital forever. 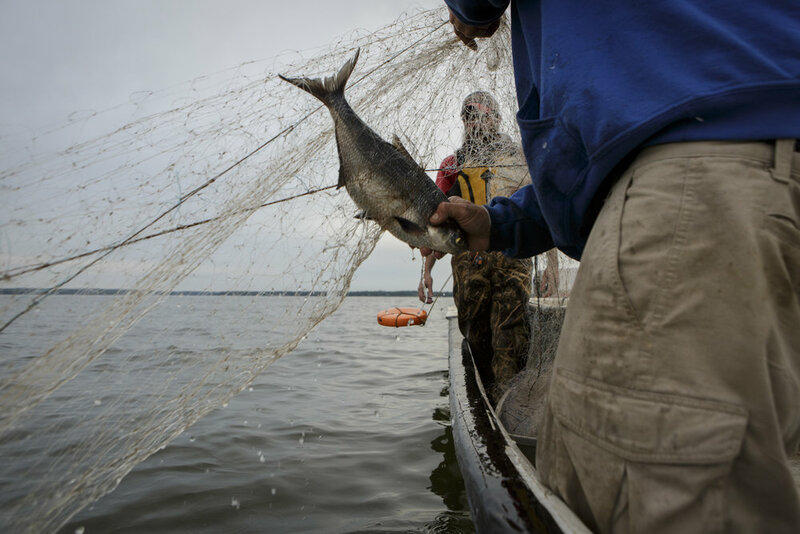 These images give a glimpse into the restocking program that ultimately restored American shad to the Potomac.